Today the three-day long national conference of the Chartered Institute for Archaeologists (CIfA) has begun in Newcastle upon Tyne. This conference has the overall title Archaeology: a global profession, with the themes of professionalism, protection and discovery. Further details can be found on the pages of the Institute here. CBA North members are taking part as session organisers, speakers and, of course, in the audiences. We hope to bring you a round-up of this from a variety of perspectives on what people heard and saw. Members of CBA North Committee, also there, will be about working on your behalf there as well. For up-to-the-minute archaeological news and views from the conference please see this #CIFA2017 link. There has already been one major national conference in the region – the Theoretical Roman Archaeology Conference (TRAC) – which this year was hosted by Durham University. If you were there and could provide a round-up for everyone else who wasn’t, please get in touch. We would like to carry further round-ups of other current and national archaeological events throughout the year; if you would like to volunteer to do such – or are organising an event large or small – please let us know. Our own Conference/Workshop is on 29 April as you all know. Our AGM preparations are also well advanced and we remind you the date to keep clear if you can is Saturday 20 May. This will also be in Newcastle this year and will be at the Great North Museum: Hancock. The details of this day will be with you soon. This entry was posted in E Newsletter and tagged conference, heritage skills training, Newcastle, Newcastle University, Training, workshop on April 19, 2017 by cbanorth. This email gives you all the details and forms for our own CBA North Conference/Workshop. It includes the announcement and invitation, programme and booking form for our own CBA North event on Saturday, 29th April 2017. In this page, and on our website page here, we have also provided downloadable versions of the documents in case you would like to circulate them around your own local groups and contacts, as well as to fill in and book yourself. A FREE event to be held at Newcastle University, Saturday 29th April 2017. You are invited to participate as a Member of CBA North. Group Members should appoint their own official representatives for this day (more especially for the workshop part). We would be grateful if individual and group members could circulate these details as widely as possible. ATTENDANCE IS NOT JUST RESTRICTED TO CBA NORTH MEMBERS BUT NUMBERS WILL HAVE TO BE CAPPED AT 60. A booking form is included below. Again please feel free to copy and distribute this to anyone who might be interested in attending. 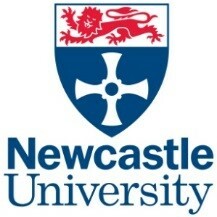 A map of the Newcastle University campus can be found here – we will be meeting in the Number 22 of the second map shown. Invited speakers (see the Programme below) will update the meeting on community-based projects from all across the CBA North Region. There will be opportunity for groups and individuals to bring display materials relating to recent and on-going work. (Please let us know in advance if you wish to do this). The meeting will start at 9.30am, but displays can be set up from 9.00am. The second part is the Sustaining Workshop where we hope you will join in a full discussion about the future development of community archaeology and local archaeology groups in the region. What are the main challenges to sustaining community-based efforts? What makes a successful local archaeology group? YOUR VIEWS AND OPINIONS ARE REALLY IMPORTANT HERE! CBA North is keen to hear what you feel that the organisation should be doing to help in sustaining local groups and building the local network. CBA North will capture the main themes and elements of this discussion for future circulation to individuals and group members. Please return your completed booking form to CBA North by 14 April 2017 if you wish to attend. If you are unable to attend but wish to make comments please use the form working to the same deadline. I hope you will join me in what promises to be a most interesting day! MORNING: We want people to share information about the current state of community archaeology in the region through a series of 20 minute ‘snapshots’ by project members and organisers, relating to some of their recent and ongoing project work. AFTERNOON: Our aim is to facilitate a wide ranging and open discussion, where those active in community archaeology can share experiences relating to areas such as funding, project development and completion, and organisational and sustainability issues. 9.00-9.25 Registration and display set up. 9.25-9.30 Introduction: Richard Forster, Chair CBA North. 9.30-9.50 ‘Down with the kids……’ How do we involve children in Community Archaeology? Dr. Jane Webster, Newcastle University YAC Branches Leader. 9.55-10.15 ‘Altogether Archaeology’- Building a Community of Practice in the North Pennines’. Mike Powell/Tony Metcalfe, Altogether Archaeology. 10.20-10.40 Landscape Survey North of Hadrian’s Wall: The work of the ‘Tynedale North of the Wall Archaeology Group’. Phil Bowyer, Tynedale North of the Wall Archaeology Group. 10.45-11.05 Roman Papcastle and Medieval Abbeytown: Working with the HLF in Cumbria. Mark Graham and Joanne Stamper, GRAMPUS Heritage and Training. 11.20-11.40 Flodden 500 Community Project: An EcoMuseum Approach. Jane Miller, Education and Outreach Officer, Berwick Museum and Art Gallery. 11.45-12.05 ‘Headlands to Headspace – Celebrating Morecambe Bay’s Heritage’. The Role of Community Archaeology. Louise Martin, H2H Cultural Heritage Officer. 12.10-12.30 ‘Mills and Border Roads: Coquetdale Community Archaeology in Action’. Chris Butterworth/David Jones, Coquetdale Community Archaeology. 12.45-13.05 ‘Interpreting PEREGRINI’. David Suggett, Community Engagement and Interpretation Officer Peregrini Lindisfarne Landscape Partnership. 13.45-14.05 The CBA North: Challenges for the Future. Richard Forster, Chair CBA North. The afternoon session will be chaired by Paul Frodsham who will also give a lead into the afternoon ‘Workshop’ by discussing his own, wide, experience of organising community archaeology projects. Coffee will be available from 14.00 so that we can have ‘refreshments’ as we talk. 14.05-14.25 The ‘Lindisfarne Experience’ of Crowd Funding: A Viable Alternative for the Future? Dr. David Petts, Durham University. 14.30-15.10 ‘So You Want to Organise a Community Archaeology Project?’…. Some do’s, don’ts and general suggestions. Paul Frodsham, Oracle Heritage Services. USING PAUL’S INTRODUCTION, THIS IS YOUR CHANCE TO SHARE IDEAS, PICK THE SPEAKERS BRAINS, OFFER YOUR OWN SOLUTIONS TO ISSUES LIKE RECRUITMENT AND KEEPING GROUPS ACTIVE AND TOGETHER. THE FLOOR BELONGS TO YOU! Does your group do fieldwork? How do you identify what fieldwork you do? What numbers of members get involved? What equipment do you have or need? What might you share with other groups (knowledge, skills and/or experience)? What training do you want/need? Do you use research frameworks or have your own? Do you apply for sponsorship and grants? What do you apply for and who do you apply to? Does your society/group give grants? How are these assessed, and for what are they given? What sums are available? What conditions do you have? What organisation do you report your work? How do you do it? Does your group produce archives? What form do they take and where do they go? Do you produce printed matter? What are your thoughts to electronic publication and/or digitisation? Do you have an existing publication? How regularly is this produced? Where is this taken? Does your group take on archives? What are your membership numbers like? Up, down or steady? What is your proportion of ‘young’ members? Where do you see your group in 5, 10 and more years? Do you have committee roles vacant? What are these? Why are these vacant? Is there any help that other groups can offer? How does the group promote itself? Does the group use social media? What is CBA North doing for you? What would you like to see more of (as an individual or a group)? What and where are the gaps in our coverage? How do we achieve a better network of local groups? What would you like to see CBA North doing? Is there a role for a regional group at all? BUT THIS LIST IS NOT INTENDED TO BE PRESCRIPTIVE! CBA North Committee will capture the key points of the discussion with a view to circulating them to those interested after the event. We hope that you enjoy the day! We will need you to book places for attending this event – this will help us in circulating the workshop discussions later. You can print out and fill in the booking form below, before sending it back into us at cbanorth@archaeologyuk.org. We have put another format of this form, as a .pdf file, with the other documents onto our website on our Conference/Workshop 2017 website page here, in case you are having problems with printing out this version which you can also fill in and send back to us. We have also attached a Word booking form for you as well here. 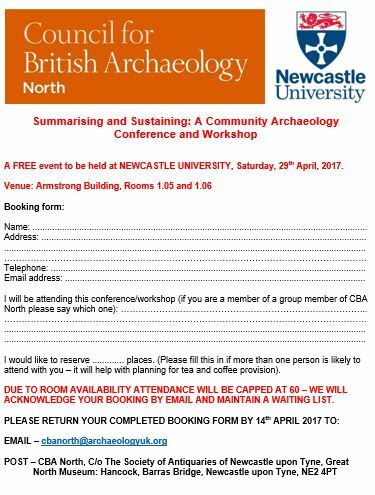 This entry was posted in E Newsletter and tagged Archaeology, CBA North, community, conference, Newcastle University on March 14, 2017 by cbanorth. Please see the attached poster for tonight’s Roman Archaeology seminar at Newcastle University. As ever, for the Romanists, this takes place in Room 1.06 of the Armstrong Building, Newcastle University. A map can be found here for those unfamiliar with the layout of the university. This entry was posted in E Newsletter and tagged Finds, Newcastle University, research, Roman on March 1, 2016 by cbanorth. The next of the Newcastle University Roman Archaeology Evening Seminars is tonight! We at CBA North have been sent the poster for tonight’s talk by James Gerrard and Andrew Agate of Newcastle University. Details of the talk “Between Three Towns: The Lufton Roman Villa in the Longue Duree” can be found here. As before this takes place in the Armstong Building of Newcastle University, and as before a map can be found on at this webpage. This entry was posted in E Newsletter and tagged Newcastle University, research, Roman on February 16, 2016 by cbanorth.